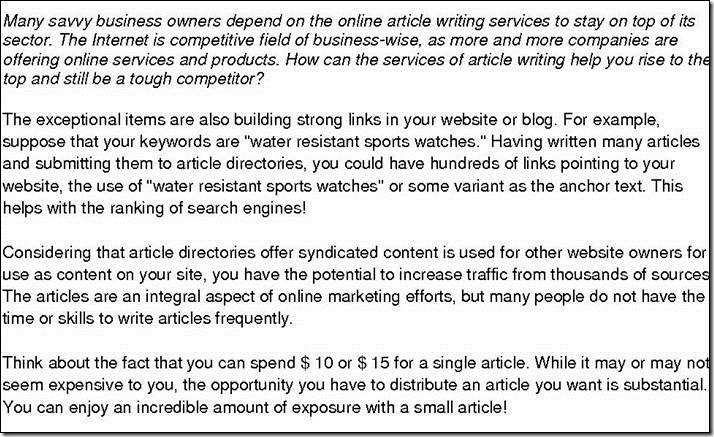 At times it is difficult not to laugh at those who wish to do content writing “On the Cheap,” especially with examples like those below. On the other hand however, it also pains us to realize that there are people who actually do pay for content like this. We suppose it could be said that they deserve it, but does anyone really deserve to be charged good money for this sort of drivel? At first blush the idea of article spinning, and article spinning software, has a certain appeal. The notion that one could take an article and massage it into completely original content at the touch of a mouse is definitely attractive as a timesaving device. Just imagine how easily one could re-purpose their own content, for example. The problem of course, is that without the use of human eyes, and a human mind, the software can’t handle the job. Only good, old-fashioned creativity – human creativity – can actually accomplish the task of original content writing. The following piece is from an article directory site that is loaded, if not overloaded, with advertising. The “subject links” in the article lead to nothing but landing pages which are loaded with more advertising. We’ve been taught about, and read plenty of, run-on sentences. We’ve even seen what we call “run-on paragraphs.” But wow, a run-on article? That’s a new one on us. 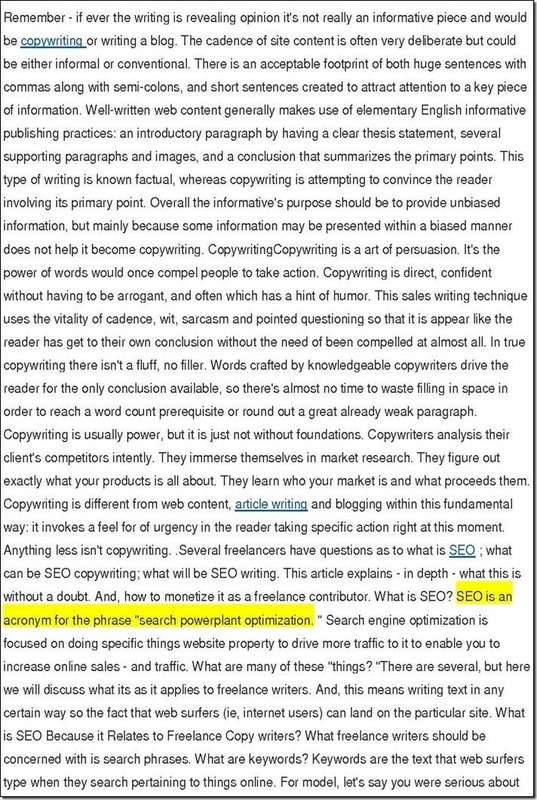 And then of course, there is the definition of SEO near the end of the “article,” (highlighted). So, do you think maybe someone used an article spinning program on this one? Ya’ think? Much? It’s pretty obvious that no human eyes so much as looked at this piece before it was posted. We’re sorry it’s so long, but it was so egregious we just had to share the entire piece. This piece is taken directly from what purports to be an “Article Directory” service, currently claiming more than 18 ½ million articles available. The “subject links” in each of the articles we found at this site lead to nothing but landing pages, packed with advertising. We think this piece was probably written by a non-English speaker, and then translated into English with translation software. After all, could an actual human being allow this to be published? These pieces are from a “News and Information” site, purported to be run by an award-winning journalist who shall remain nameless, and promoting an article directory service. There is a great deal of advertising on this “News and Information” site. In fact, a great deal more than there is news and information. This is a bad combination of poor article spinning and lousy translation. 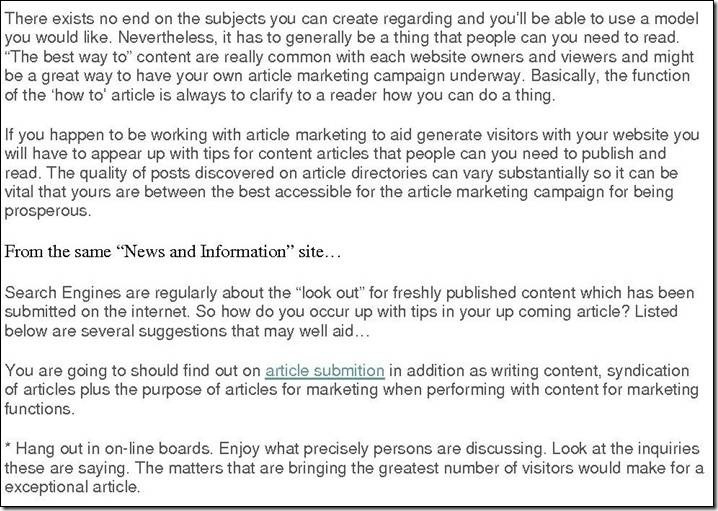 The first piece is, sort of, a “How to” on article writing, while the second piece is, sort of, a “Tips” piece. Both are nearly incomprehensible and absolutely worthless. We believe these to be a combination of poor spinning, bad translation, and atrocious editing; probably by someone from Siberia. Reading these really made our eyes cross and our heads spin. This piece was taken from a WordPress website which contains no information about its author, i.e., no “About Me” or “Home” page. This site seems to be all about what we call “Article Stuffing,” simply filling a site with articles on a wide variety of subjects, with multiple articles posted each day. Most of the “links” within each article seem to lead to Landing Pages and/or Sales Pages. Oh, and there is plenty of article spinning here too. Trying to actually critique such nonsense would be, well, nonsensical. To think that someone has actually posted this to a blog is ridiculous, yet there it is, in black and white. From a WikiWP WordPress site. This theme gives the website a very professional look, at the same time making it seem as if it is associated with Wikipedia. This seems misleading. Deconstructing this would be worthless, but we found the concept to be the most intriguing aspect of this piece. 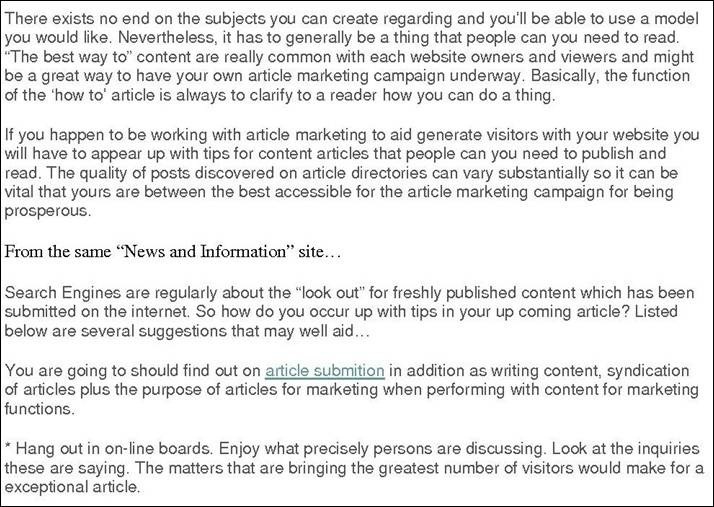 In it, the “author” gives advice on how to make money from article writing – without actually doing any writing. 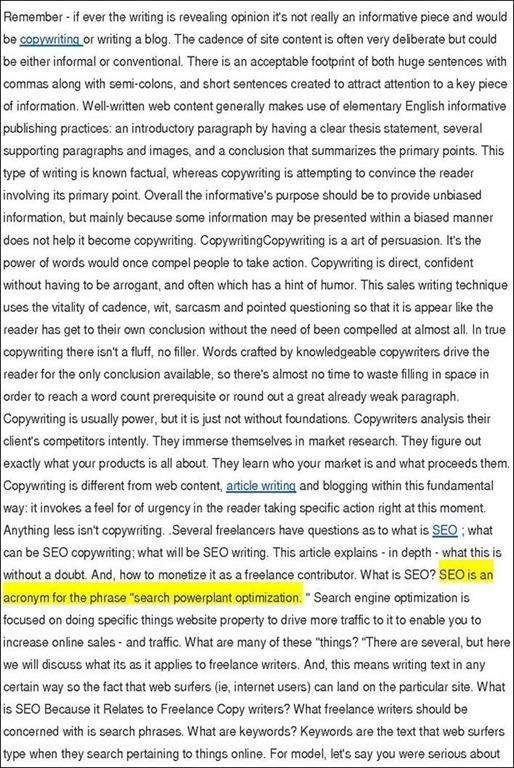 Essentially, he advises buying articles from ultra-cheap content writing services to sell as your own. Yeah, and as we’ve seen above, the quality is just so amazing, you’ll soon be rolling in cash. There are countless content writing and article writing services available online today, with prices which range from a few dollars for 500 words to more than ten times that. For the best value, something in the middle makes sense. 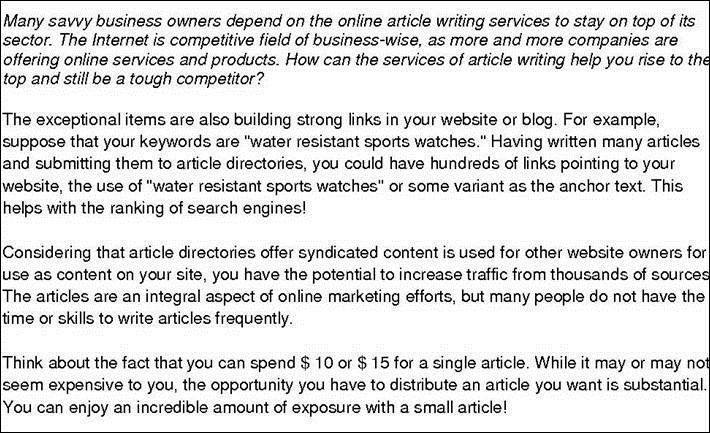 Be careful however, as paying more for writing services is no guarantee that article spinning will not be used. Check out the service closely and don’t commit to a large project until you’ve tested the service yourself. One of the oldest sayings in the sales business is, “Price is what you pay, value is what you receive.” This is as true with content writing services as in any other field. Those “cheap” articles that some people buy are just that, cheap. There is no value in the content they generate; not for the reader or for the buyer, and article spinning adds nothing to the value. In fact, there are at least five reasons not to use article spinning, as explained here: Article Spinning – 5 Reasons You Shouldn’t Do It. Quite simply, article spinning is a waste of time and money – a waste of your time and money. 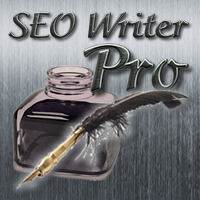 This entry was posted in SEO Writer and tagged article spinning, blog content, content writer, content writing, online content, seo articles, seo services, writing services, writing shortcuts. Bookmark the permalink. Only one article spinner in the market today that is keeping up with Google’s Panda update through its advanced functionality called “Parts of Speech” processing engine that is embedded into its database of synonyms. This seemingly “artificial intelligence” feature carefully analyzes the context of the word in each sentence to make sure the synonym substitute won’t affect the readability of the spun version. Check out Spinchimp. Thanks for your comment. I will take a look at it but, so far, with every spinning program I’ve seen I am able to generate truly original content more quickly from my head than from a software program.